For the last eleven years, June has opened with a bang in Holloway. That's because for the first eight days the town celebrates its annual arts festival; bringing entertainment to the streets with music, art, dance, literature, and more, it is an event that lifts community spirit, and gets everyone ready for the joy of summer. The twelfth Holloway Arts Festival runs from the 1st - 8th June, and has a long line up of free and low cost activities. The theme this year is 'Meet the Neighbours', and kicks off with the Hornsey Street Festival at 1pm. Featuring Live Art duo, Hunt and Darton, who will host an interactive pop-up café with afternoon tea, unusual performances by Stop! Look! Listen!, and other acts such as Silversmith Dance Company and Party Like It's 2012. Take part in a balloon twisting headdress making workshops, and if you want to be ready for the carnival parade, on the 31st May, there will be a costume making working. 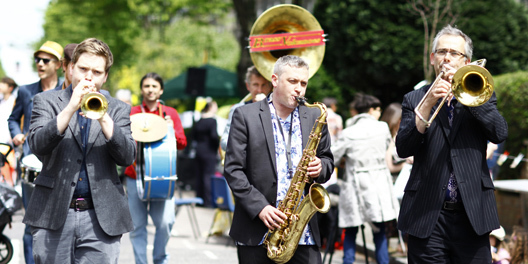 If you miss the Hornsey Street Festival, then go to the Mayton Street Festival on the 7th June. t will include an afternoon tea party, pop up photo booth, craft workshops, and the over 55s Funky Disco Dancers. Other activities throughout the week will include a poetry open mic night, songwriters' competition final, Cabret of Dead Souls, under 5s picnic, and Ladies' Circle. The festival will come to an end with a closing party at Filthy's Bar.